WorldVeg germplasm is now found in one in six commercial hybrid tomatoes sold in India, and one in three public-sector hybrids. Indian seed companies now have access on their doorstep to seed of some of the world’s best tomato and chili lines. These new lines will help farmers generate more income because they produce more and better quality fruit, and have pest and disease resistance in their pedigrees, meaning farmers can use less pesticide, save costs, and tap new market opportunities for safe vegetables. 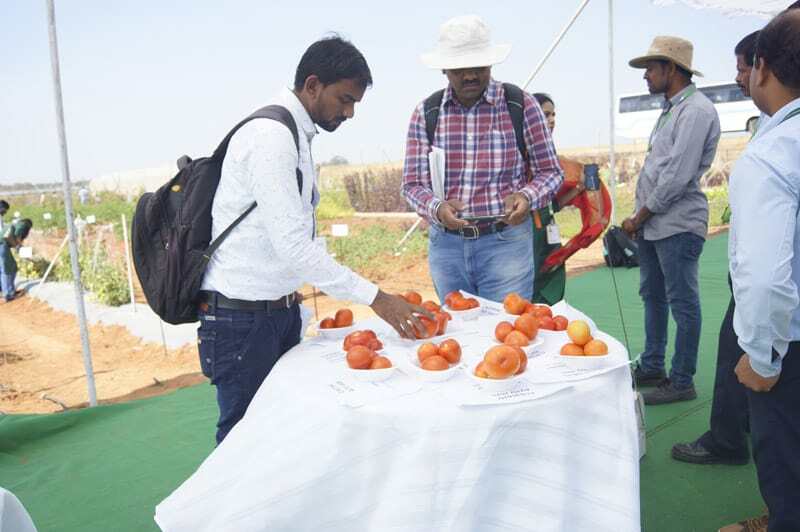 During the annual World Vegetable Center Tomato Field Days on 18-19 January in Hyderabad, India, over 80 seed industry staff representing more than 40 companies from across the country got a closer look at some exceptional new varieties bred by WorldVeg. 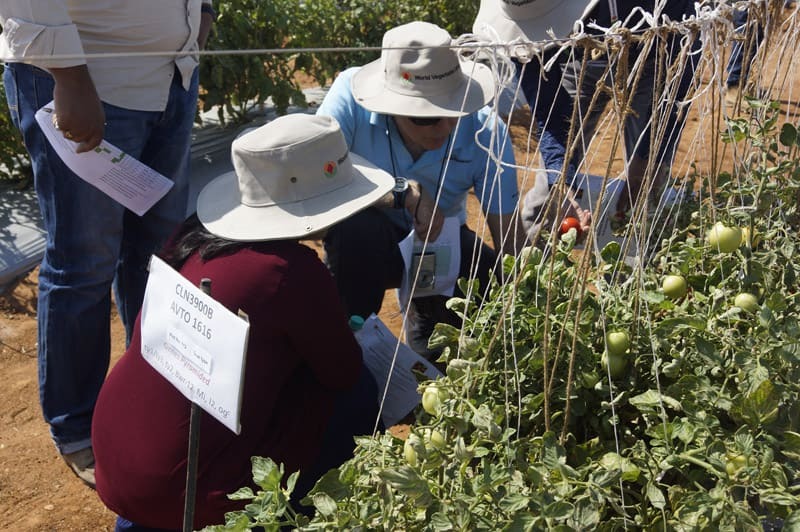 Established to provide ready access to improved international germplasm for Indian seed companies, the event’s main attraction was a range of highly disease-resistant tomato lines and new improved chili lines. Germplasm from the World Vegetable Center has been widely used to help breed improved vegetables in India. It is now found in one in six commercial tomato and chili hybrids sold in the country, and one in three public sector-bred hybrids. New dual-purpose tomato lines—so-called because the fruit can be consumed fresh or used for processing into sauces, juice or other food products—sparked plenty of interest among the participants. Only 1% of the Indian tomato crop is processed compared to an average of 27% for other major global producers. Much of the rapidly growing urban demand for processed tomato products is supplied by imports because of local quality problems. Tomato processing in India relies on intermittent supplies of low-priced, poor quality fruit, often sourced when gluts arise from overproduction. Quality dual-purpose tomatoes that can be successfully sold for the fresh market and improve processed products will help create a specialized processing industry in India to benefit farmers, processors, and consumers. WorldVeg tomato breeder Peter Hanson and WorldVeg chili breeder Derek Barchenger discussed the Center’s breeding work to address virus resistance in tomato and chili. Many farmers repeatedly spray their crops with pesticides in a futile attempt to control whiteflies, a pest that spreads viruses. Breeding resistance into the variety is the best and most cost-effective approach to virus control. Seed companies are trying to produce stable disease resistance and to address the complex of viruses involved. A major focus of their concern is tomato yellow leaf curl disease caused by begomoviruses. 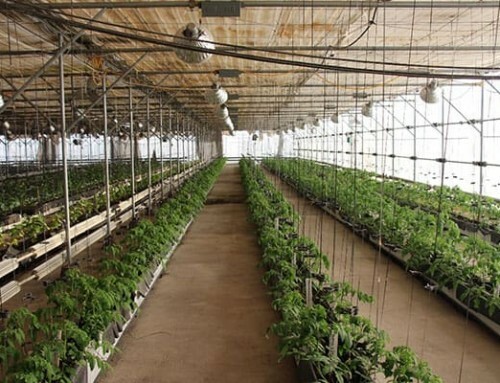 Multiple resistance genes for this disease have been introduced by the World Vegetable Center into both fresh market and processing tomatoes. 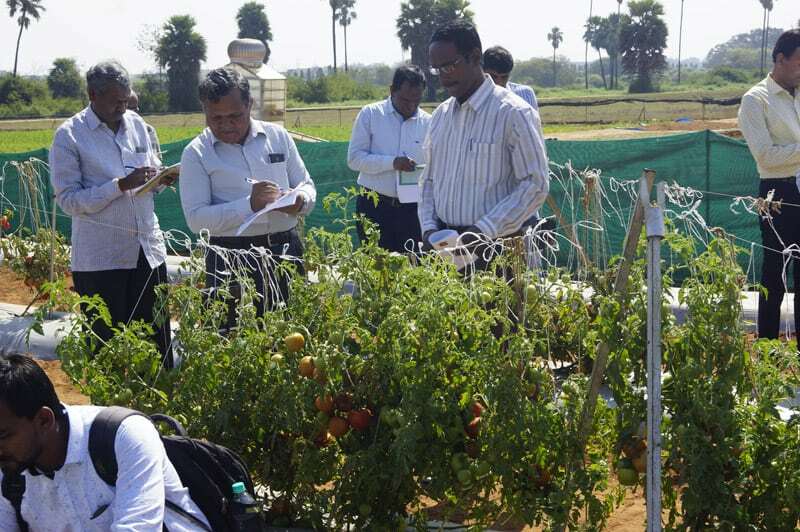 Participants eagerly took notes during the inspection of the improved lines in the WorldVeg research field in Hyderabad. Seed from these lines is locally produced and distributed across India by WorldVeg seed production officer Lucy Sarkar. Wider distribution of the seed will help improve the incomes of farmers with higher yielding disease-resistant crops, less need for spraying, and new market opportunities. Participants also viewed disease resistant chili lines and improved lines of cucumber, bitter gourd, Chinese cabbage and Basella from the World Vegetable Center. 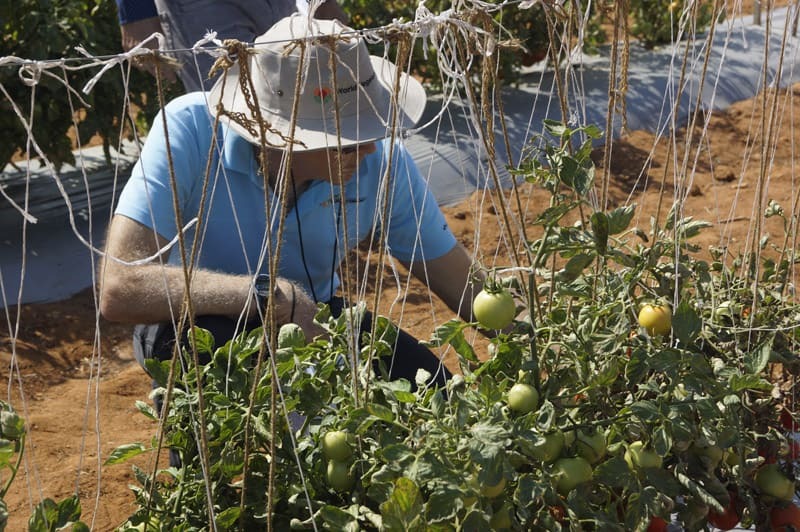 Checking tomato for fruit quality: color, firmness, shape and other characteristics. Peter Hanson, WorldVeg Lead Scientist Global Plant Breeding, checks on fruit quality in the field. Seed company representatives evaluate plants during the field day.